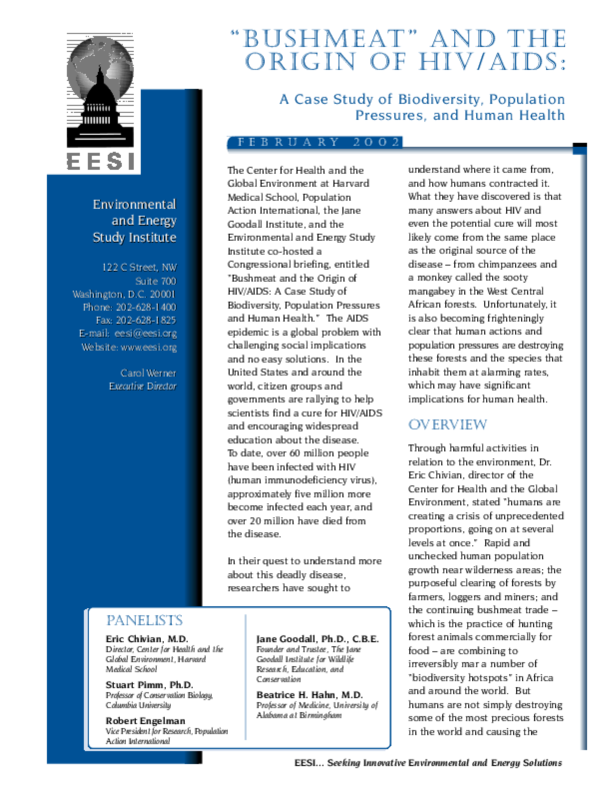 The Center for Health and the Global Environment at Harvard Medical School, Population Action International, the Jane Goodall Institute, and the Environmental and Energy Study Institute co-hosted a Congressional briefing, entitled "Bushmeat and the Origin of HIV/AIDS: A Case Study of Biodiversity, Population Pressures and Human Health." The AIDS epidemic is a global problem with challenging social implications and no easy solutions. In the United States and around the world, citizen groups and governments are rallying to help scientists find a cure for HIV/AIDS and encouraging widespread education about the disease. To date, over 60 million people have been infected with HIV (human immunodeficiency virus), approximately five million more become infected each year, and over 20 million have died from the disease. In their quest to understand more about this deadly disease, researchers have sought to understand where it came from, and how humans contracted it. What they have discovered is that many answers about HIV and even the potential cure will most likely come from the same place as the original source of the disease -- from chimpanzees and a monkey called the sooty mangabey in the West Central African forests. Unfortunately, it is also becoming frighteningly clear that human actions and population pressures are destroying these forests and the species that inhabit them at alarming rates, which may have significant implications for human health.